Source: John Mason Neale, ed., Medieval Hymns and Sequences, First Edition. London: Joseph Masters, 1851, pp. 119-120. 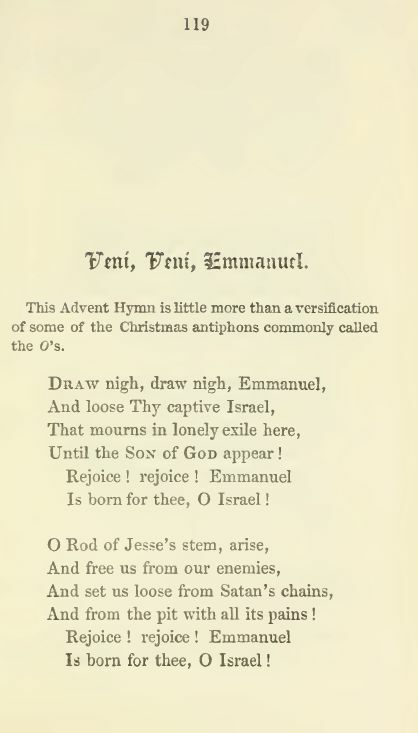 Note: The lyrics in this edition are different in many respects from the Second and Third Editions of Medieval Hymns, and from the 1851 and 1856 editions of The Hymnal Noted. Is born for thee, O Israel! And from the pit with all its pains! To give us comfort from on high! 4. Key of the House of David, come! Reopen Thou our heavenly home! 5. Ruler and Lord, draw nigh, draw nigh! This translation was significantly modified by Rev. Neale in the Second Edition of Medieval Hymns and Sequences, and his other subsequent publications including the . See: Draw Nigh, Draw Nigh, Emmanuel (Neale, Version 2). That version would be modified to become the familiar O Come, O Come, Emmanuel. Also found in Rev. Joseph Oldknow, ed., Hymns and Introits (London: Masters & Son, 1870), #39, pp. 36-37.